Nicole joined Grand Wealth Management in 2011, adding an international flair to our team, as well as a service-oriented focus and a warm, welcoming demeanor. Nicole and her colleague Doug Johnson collaborate on providing daily service and support to our financial advisors as well as participating in direct client care. Together, they also assist with investment portfolio administration and a range of special projects aimed at adding value to our client experience. 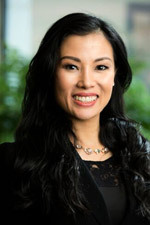 Before joining Grand Wealth Management, Nicole was a banking and trust specialist at Macatawa Bank, as well as for an international bank in Saigon. She is a founding director for the Asian Community Outreach, a local organization dedicated to giving back to the community and supporting Asian immigrants through scholarships, eldercare and other networking programs. Nicole emigrated from Vietnam to the U.S. in January 2000. She, her husband, their three daughters and Nicole’s mother make for a busy but happy household. They love to travel, with a goal of visiting a new state every year.